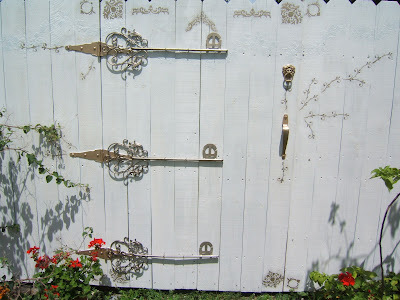 Sooooo.......as I'd been looking through all kinds of pics online even as recently as 2 days ago, I tried to figure out how I can create a look like this without the expense or need to travel to another time to find such beautiful ways to makes doors beautiful. As serendipity would have it, I did have to go out today for some food actually, and there was a store I'd never been into next to my favorite Italian Market, and when I came out I looked at it and said, "Ive never been in there what do they sell, let me just look inside''. LO and BeHOLD ! there in the back, on the wall were hanging some heavy rusted iron work decorated filigree crosses, old time door knockers, and other things, nice and flat to be hung, not on a wall, as it happens in my case, but on a GATE ! I grabbed the doorknocker and some crosses but I'd need quite a few to make an interesting pattern as the crosses themselves were a bit small. I wandered around the store a bit more and there was a section that was 50% off, and when I looked up I saw something very interesting......GRINS.......and they had three....:D:D:D.....and they were 50% off. I didn't have to think about this since I only had $15.00 to spend without getting into trouble. I went to pay for them. When I got to the register with my three items, the cashier lady looked at them and said "the keys to the kingdom''?.......and that is when I knew exactly what I wanted to say on my front gate...as I also wanted to have some words on the Gate to let people know the DoorWay to which they were standing in front of and in addition to the words ''Fairy Cottage and Garden'', I wanted to have something else, and she just uttered the beginnings of it. In my mind I finished it and decided that's what I was going to put on the Doorway. "The Keys to the Kingdom, Are Held By the Gardeners of the World." I got home and went to work. I had to paint over the center medallion stencil and a bit from the top to make the metalwork look right, and so I did that. I also couldn't decide whether or not to leave them black or paint them to match the hinges.....matching the hinges won out. And so I did that, and attached them 'somewhat' to the door.....and I am most pleased! 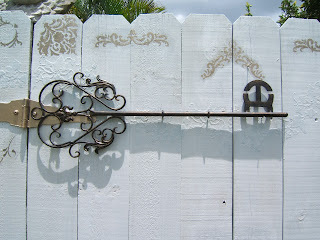 While I love the stenciled work, I love even more layers of textures. I'm getting closer to the kind of GateWay, or Doorway I want.....which is more a portal of some kind into another world.....my world, a world of magic and beauty......and the GateWay tells you so. I added a lion head knocker since it was lying on the table for the other door unused. Now its has a place. As it was black, which was great, but clashed a bit too much with the hinges. I needed it to blend. Does it have a marker? an in-between place? 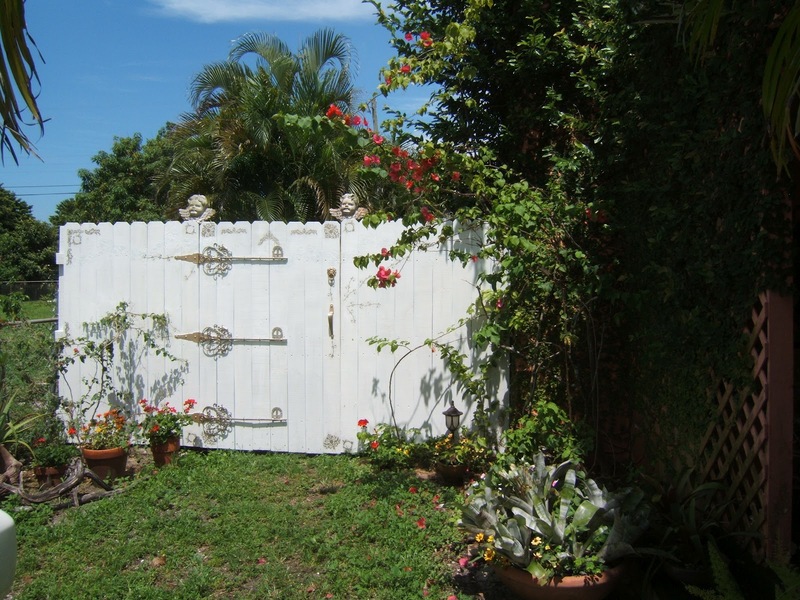 a doorway, a gate? something that tells people they are entering a world of Nature, fun and Play? a world of your own making? 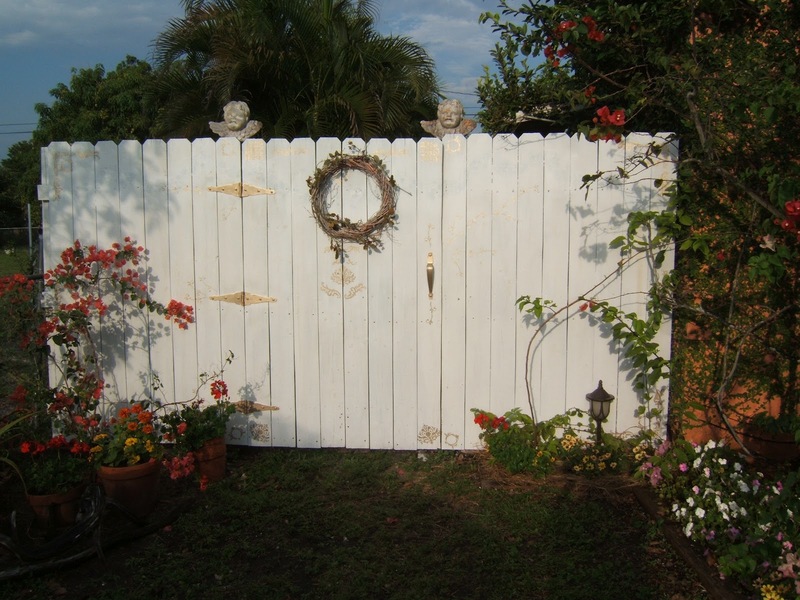 What does your garden gate or doorway look like? What does it hint of when people stand before it? Does it cause people to pause, and feel..........that maybe they are entering a place of miracles and wonder? Does it say something to the observer? Do you want to invite playfulness into your world? 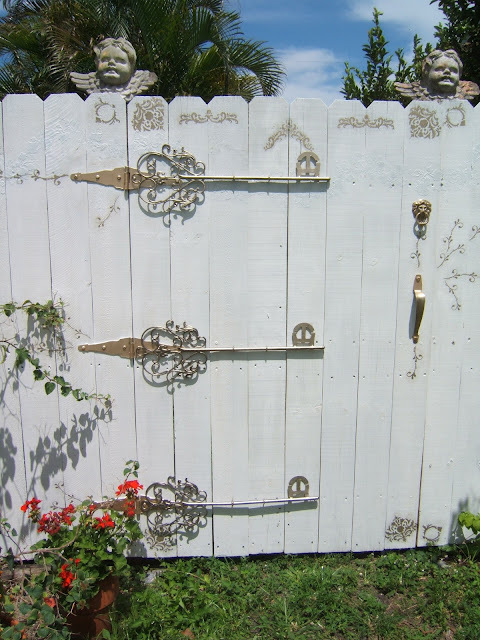 Anyone can go to TJ Maxx, Beall's Outlet, Marshalls, Home Goods, Target, JoAnn's Fabrics, etc......and find some garden metal work and attach them to their doors and gates! Lets Play! Oh my goodness--I love those! That looks perfect. What a lucky find! Oh goodness.....dear friend....you did a marvelous job on that gate. I really like how it turned out. Your gate has so much personality now. Love your idea! 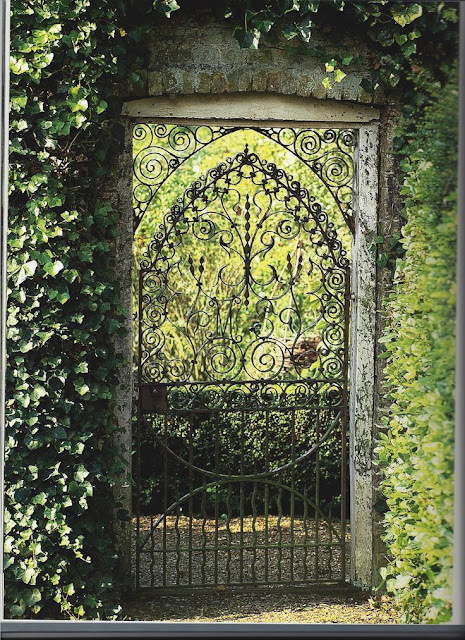 I just LOVE your garden gate, it is certainly inviting!! oh my what treasures lie behind that magic portal? Wonderful, just perfect! So cute! I would have never thought to do that. Love the way it turned out, thanks for the inspiration! So inspiring! You did a lovely job. It looks like a gate to an enchanted place. 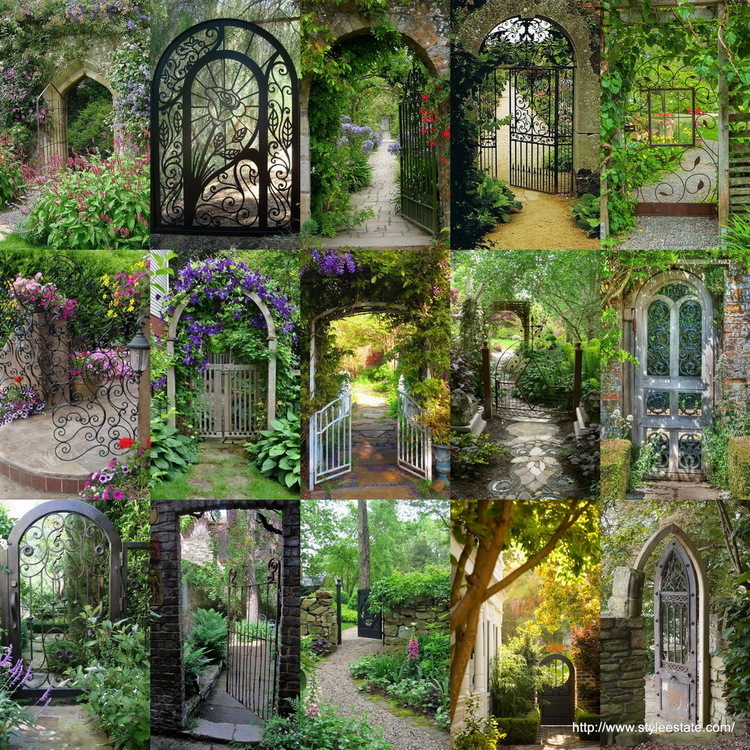 It's like your own secret garden! I love it. The hardware on the door is really neat too. 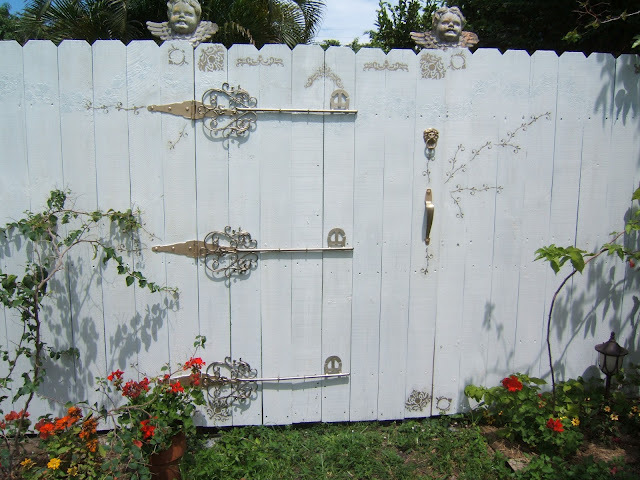 I love the garden gate!! You did a great job!! 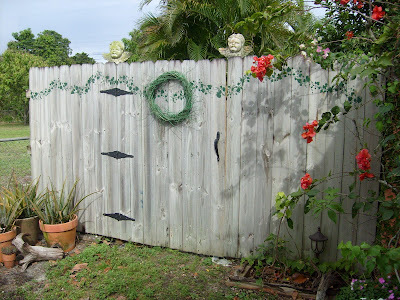 I so loved this post-- I know that its been a long time since you posted it - but that serendiptious story was just incredible and your gate looks so beautiful, it truly marks the entrance to an enchanted place and makes the heart flutter with anticipation at the delights one might find and see---and wonder : will there be fairies waiting to greet me? Thank you Harplight, for reading especially after all this time. lol. I had to read this post again and it felt like I was reading from another lifetime, so much has happened since then....but I could remember as I read the experiences and how fun it felt to make my little gate. I don't have those keys anymore, I couldn't take everything with me when I moved....and moved again since then, but I am still dreaming, and intending for magical gateways to magical realms! Thank you!